(Nanowerk News) Scientists at the National Institute of Standards and Technology (NIST) have developed* the world’s most efficient single photon detector, which is able to count individual particles of light traveling through fiber optic cables with roughly 99 percent efficiency. The team’s efforts could bring improvements to secure electronic communication, advanced quantum computation and the measurement of optical power. Using essentially the same technology that permitted them to achieve 88 percent detection efficiency five years ago,** the team has enhanced its ability to detect photons largely by improving the alignment of the detector and the optical fibers that guide photons into it. The basic principle of the detector is to use a superconductor as an ultra-sensitive thermometer. Each individual photon hitting the detector raises the temperature—and increases electrical resistance—by a minute amount, which the instrument registers as the presence of a photon. 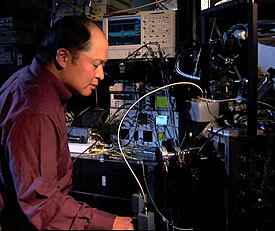 NIST physicist Sae Woo Nam works with refrigeration equipment used to cool photon detectors to nearly absolute zero. His team’s efforts have created devices that can detect single photons with 99 percent efficiency. According to team member Sae Woo Nam, the advantage of this type of single photon detector is that the new detector design not only measures lower levels of light than have ever been possible, but does so with great accuracy. The ability to count individual photons is valuable to designers of certain types of quantum computers as well as scientists engaged in quantum optical experiments, which concern exotic states of light that cannot be described by classical physics. But one of the most promising potential applications of a high-efficiency photon detector is a way to secure long-distance data transmission against unwanted interception. A detector that could recognize that a photon forming part of a transmission was missing would be a substantial defense against information theft. The team has optimized the detection for 810 nanometers—an infrared wavelength—and it still has high efficiency at other wavelengths that are interesting for fiber optic communications, as well as the quantum optics community. Ironically, the detector is so efficient that it outstrips current technology’s ability to determine its precise efficiency. The team is currently working to develop evaluation techniques that can measure up to the detector’s abilities, and Nam says the team’s creation could also help evaluate other light-gathering devices. * A.E. Lita, B. Calkins, L.A. Pellouchoud, A.J. Miller and S. Nam. Superconducting transition-edge sensors optimized for high-efficiency photon-number resolving detectors. Presented at the SPIE Symposium on SPIE Defense, Security, and Sensing, Orlando World Center Marriott Resort and Convention Center, Crystal J1 Ballroom, 3 p.m. April 7, 2010.